In March, I did my first team & individual portrait shoot for Wallers' GymJam Academy in Santa Clarita, CA. It was a very fun experience and I loved working with all of the talented young gymnasts to create such unique portraits. Read more about the day and see some of portraits below! "Her pictures capture the personality and emotion of the gymnasts in a powerful way. She and her crew provide a wonderfully relaxed atmosphere that beguiles you into enjoying the process and surprise you with their professionalism. Friendly, relaxed, professional. We will hire her again next time!" When Chris Waller (owner of Wallers' GymJam and Associate Head Coach of UCLA Gymnastics) first approached me about doing team portraits for his gym, I have to admit that I was initially apprehensive - I had never done a portrait shoot of this scale before. However, I'm not one to turn down a challenge and Chris, who I've worked with over the past three years as UCLA Gymnastics' team videographer, assured me that he believed in my ability to pull it off. The shoot day rolled around and I headed up to Santa Clarita with my team. Along for the ride were: my assistant photographer Khai (who would be handling the team portraits while I worked with the individuals) and my assistants Annie and Lorraine (to help with check-in and admin). The first group of the day was the boys team. This turned out to be a great decision, because the gym was relatively calm in the morning compared to later in the day when the multiple girls teams and disciplines arrived. Khai and I had decided to shoot the portraits with our cameras tethered to our computers so that everybody would be able to see the photos in real time. This made for a fun, interactive photoshoot environment with constant feedback, which comes in really handy when photographing a sport like gymnastics where visual aesthetics are key. Not to mention, the kids had a blast Snapchatting their favorite shots to their friends. I had decided before the shoot that I wanted to create portraits that were unique and different than your run-of-the-mill gymnastics team photos. 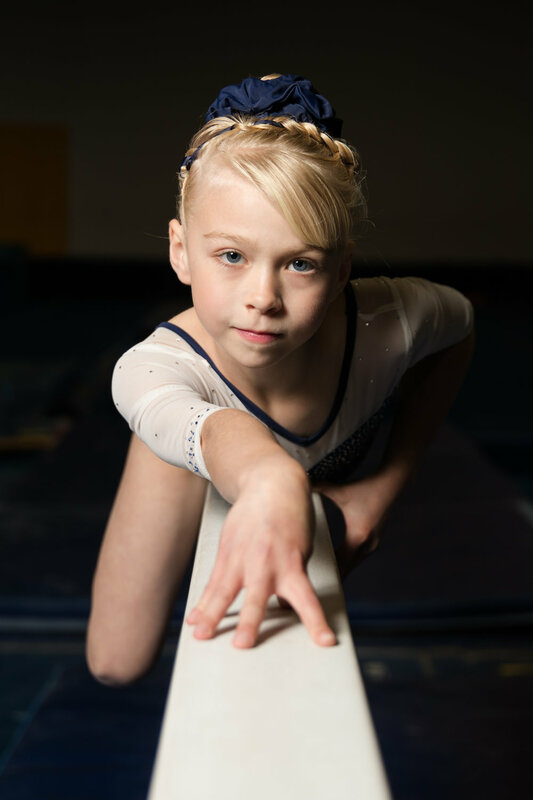 It was important to me that the gymnasts and parents would feel like the portraits accurately captured the gymnasts' strengths and personalities, while making them look like superstars. To do this, Khai and I decided to set up our lighting in a way that would make the athlete pop against the background, while also adding some soft shadows for a dramatic flair and (much to the boys' delight) accentuated muscle definition. I didn't want to use a generic background, and this lighting setup gave the effect of the gymnasts posing alone in a darkened gym. I like that when they look back on these photos in future years, they'll see themselves back at GymJam, a place they spent countless hours every week practicing the sport they love alongside their best friends. The gym grew more lively as the day wore on and more gymnasts came and went. At times it certainly felt a little hectic, but overall it was so much fun to work with such creative and talented young gymnasts to create team and individual portraits that showed the beauty, the strength, and the silliness that comes along with being a gymnast. By the end of the day I had taken portraits of over 70 athletes and Khai had photographed over 30 different teams. Annie and Lorraine were superheroes throughout the day helping with check-in, explaining the ordering process, and even jumping in to help the athletes come up with their best poses. At the end of the super long day we rewarded our exhausted selves by jumping into the pit, where we probably could have dozed forever. "Bethany and I love love love her beautiful photos! Just wanted to thank you again for working with her so well, being so sweet to us, and for creating such brilliant photographic artwork. These pictures are a treasure that we will always cherish!" Interested in having me shoot your gym's portraits?